Even though I live in a lightly populated state in the Rockies, a lot of my strategy as a trout guide is not about the traditional fishing skills of reading water and fly selection and presentation. Instead, it revolves around dealing with fishing pressure–finding less-fished water, picking a stretch of river or scheduling the day to avoid as many other anglers as possible, figuring out how to get a fish who has seen too many flies to eat the one at the end of my client’s tippet. We all dream about the days our grandfathers enjoyed, fishing for unsophisticated quarry, with the beauty of nature and wildlife as our only companions. But unless we travel to far-flung corners of the earth or have the means to buy our own private chunk of it, this experience is becoming harder and harder to find. For many of us, the best chance to get away from our fellow anglers, even for a day, is to throw away our favorite “what rock to stand on” statewide fishing guides, ignore the latest updates on the fly shop websites and strike off on a bluelining adventure. Bluelining involves finding those little blue lines on a map that mark obscure (and hopefully, unfished or lightly fished) small streams–and then figuring out how to get there. The technique can be practiced anywhere there are small streams and fish, but I’ll limit this discussion to my part of the Rocky Mountain West, where I have some experience. In the West, many of the small mountain streams that qualify as targets for blueliners originate on public lands managed by the US Forest Service and the Bureau of Land Management. Access to these drainages is often provided by logging and mining roads or public trail systems, so procuring current USGS topo maps for the area, along with Forest Service and BLM maps, is a good first step. Recognize that sometimes the map won’t tell you the whole story. You may find a blue line but no stream when you get there, as flows may be seasonal, or the stream may be dewatered due to irrigation or drought. On the other hand, you may discover that the stream is a longer drainage than what shows on the map. If there is relatively easy access by road or trail, use maps to look for places where the stream and road or trail are not completely parallel. If access requires even a little cross country hiking, it will discourage most casual anglers. And it will definitely get you away from the ATV crowd. Learn to read contour lines on your topo maps, as the need to clamber into a steep-walled canyon can also keep pressure to a minimum. In addition to maps, there are a few items every blueliner should have in their kit. Even if you intend to finish the adventure on foot, make sure you have a spare tire (with air) and a lug wrench in the vehicle that is getting you to the trailhead. If the roads are really bad, don’t use 4-wheel drive until you get stuck. Even if you are planning a day trip, carry food, water, and enough basic survival gear to get you through a night in case the car breaks down or you get stuck. On the trail, be sure to carry water. You might be tempted to drink the water out of seemingly pristine mountain creeks, but talk to someone who has suffered through a bout of giardia, and you’ll change your mind. Bring a compass–but only if you know how to use it in conjunction with your map. It should be mentioned that some anglers are adapting modern technology to the challenges of bluelining. I recently read a very informative magazine article about finding and cataloging small streams using online mapping (aerial photos as well as online topo maps) in conjunction with a GPS unit. This is a very effective approach, but to me, the lure of bluelining recalls a child’s fantasy of following a lost pirate map to an unknown treasure, so I’d rather keep the technology on the primitive side. Many of these small streams run through private property in their lower reaches before they join larger streams or rivers (you know, the ones clearly marked on your highway map and mentioned on the white board in the local fly shop). Some blueliners may not bother with seeking access on private water, as it might seem to violate the ground rules of the process, and will always be looking for the upstream end of the blue line on the map. But the lower elevation reaches of these streams are often lightly fished, for a totally different set of reasons. So don’t knock it if you haven’t tried it. Or, more to the point, try knocking on a few doors to see if you can get permission to fish. It can be problematic, since you may be dealing with absentee owners (who aren’t there to give you permission) or recreational owners who bought the property so they wouldn’t have to go the work of bluelining. If you see brand new jack rail fences and “no trespassing” signs every fifty feet, you’re probably out of luck. Look for the water with an old ranch house and a beat up truck parked by the side door. An old rancher may tell you to get the hell out, but lots of anglers don’t take the time to ask, so you might be pleasantly surprised what a courteous request will bring. If you are lucky enough to be granted permission, don’t be in a rush to leave, even if you think catching a fish in the next ten minutes is the only priority in life. If you get invited in, you may have to drink a couple of cups of stale ranch coffee and listen to a few stories about last winter’s weather or commodity prices. But you might also learn where the neighbor’s kid caught the 3 pounder on a night crawler or find out that cousin Bill has bigger fish in the creek on his place, and his ranch is only 20 minutes away. Let’s assume our skills at bluelining have brought us to a productive stretch of a small mountain stream. So what is small stream fishing all about? The remote small streams that are the objective of blueliners are generally in the headwaters of larger drainages. 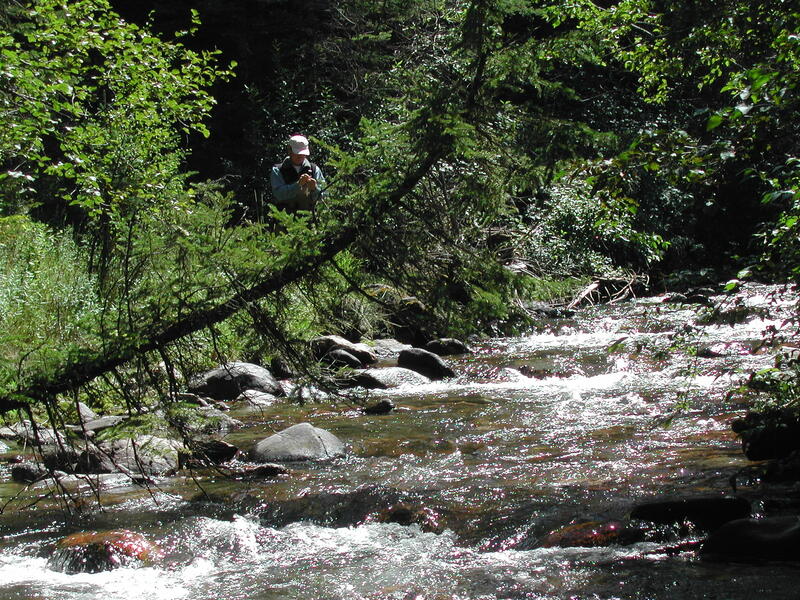 At high elevations, such streams offer trout a short growing season and a relatively limited food supply, compared to larger freestone rivers and tailwaters. Anglers should expect to find populations of wild (often native) fish, but the size range will be smaller than what we expect in richer environments. But don’t discount the big fish potential of tiny creeks at first glance. Some mountain streams have surprisingly rich food supplies, and if the stream provides sufficient cover, even if it is separated by long stretches of marginal habitat, you may be shocked by the size of fish in some tiny creeks. If you have spent most of your fishing time on crowded tailwaters where the fish are conditioned to the constant presence of humans, you may be surprised to see trout act like truly wild creatures. A careless approach will result in a fish that bolts for cover, and it may stay hidden longer than you care to wait. Stay low, move slowly, and look carefully before you cast. Because of the typical high stream gradient, fast water—with short stretches of slower flows—is the norm in most mountain creeks. In the traditional jargon of reading water, you can think of this as either a succession of short riffles and miniature pools or as “pocket water”. My standard approach on this kind of water is to fish upstream, staying in the water as much as possible, often wading right up the middle of the creek. This minimizes the sacrifice of clothes and skin to thorns and thistles, and casting over the stream channel helps keep the fly out of trees and streamside brush on the backcast. If you do spook a fish, it will dart downstream past your feet (into water you have already covered), but it won’t vault over the lip of the pool, scaring the fish in the water upstream. In most cases, the fish will be concentrated in the head of each pocket or tiny plunge pool, where broken water and depth give them security. Since the trout will come to the fly readily, fish thoroughly but quickly—get a couple good drifts through each likely spot and move on. Be sure to hit any deeper pockets of dark water, especially undercut banks and around log jams. On many small creeks, canyon walls and surrounding forest protect the water from the sun. Fish will hold in the shady spots and deeper water on warm summer days, but don’t neglect the shallow tailouts of the pools, especially in the morning hours and early and late in the season. Tackle requirements can be kept very simple—in this era of high tech tackle and accessories, I find this to be one of the real charms of small stream fishing. You’ll need a rod and reel, a box with a few flies, a spool of tippet, line snips, and some floatant, but that’s about it. You might be able to get all of the fishing gear in a shirt pocket, but if you want a few extra items for longer hikes—camera, sketch book, bird or plant ID book, water bottle, sunscreen—try a lumbar pack or a chest pack that converts into a “sling” shoulder bag, so that it is completely out of the way when fishing. 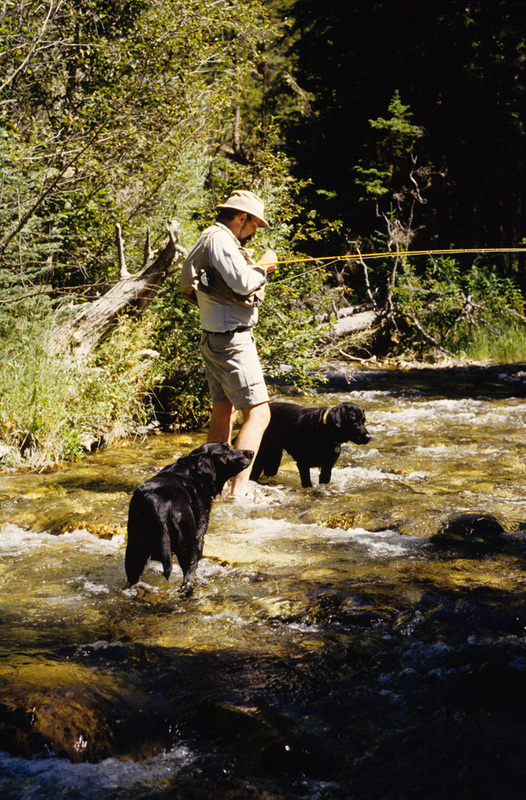 Since trail access and water flows make fishing high country streams mostly a mid-summer activity, air temperatures should allow you to wade wet, even if the water is cold enough to demand frequent breaks from wading to warm up your toes. 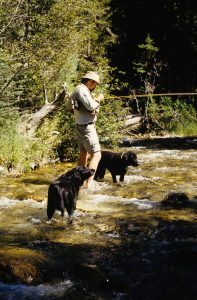 On short walks, you might get away with using wading sandals for both hiking the trail and fishing. On longer or more rugged hikes, you can make your waterproof hiking shoes do double duty as wading shoes or carry wading sandals in your pack. Shorts are an option, but quick-drying long pants offer more protection from sun, biting bugs, and nettle. A packable lightweight rain jacket is a must, as afternoon thunderstorms are a nearly daily occurrence at high altitude. The ideal small stream rod is short (6½ to 8’). A short rod makes it easier to maneuver through willows or thick brush, and you don’t need much rod length for mending and line control on such small water. One effective method of presentation for this short range fishing is “dapping”—holding most of the line and leader off the water to minimize drag. Light line sizes (#2-4) are fine for the size of flies you’ll be casting, and a light line rod will make catching small fish more fun. But watch out for some short graphite rods—they may be rated for 3 or 4 weight, but have tips so stiff they would fish better with a 6 or 7, and they are impossible to cast accurately at short range. My personal favorite tool for this fishing is a vintage 7’ fiberglass rod that loads easily with just a few feet of line past the tip. Fly selection on a small mountain stream is not complicated. Given the typical sparse food supply, the fish will rarely be selective. A handful of impressionistic or attractor dry flies, including classics like the Parachute Adams, Elk Hair Caddis, or Royal Wulff, should be all that you need. (In fact, this is a good time to use up those scruffy flies in the corner of the box that you can’t quite bear to throw away.) For the middle of the summer through early fall, I find a fly that suggests caddis, small stoneflies, or a terrestrial—like a Rubber Leg Stimulator, Madam X, or Turck’s Tarantula in size 10-14—is a perfect all-purpose pattern. Fish a fly big enough that the tiniest residents of the creek won’t injure themselves by getting impaled on the hook. You’ll still have fun watching these small fish fight to drag your fly under the surface. But be careful you don’t overdo it—if you fish a fly too large, none of the stream’s residents may be able to cram it into their mouths. If the water is too cold for the fish to rise to a dry fly and you find yourself reaching for split shot, I’d suggest you have come too early in the season. But if you want to plumb the depths of a deeper pool with a nymph, don’t overthink the situation. Your nymph selection need not be more extensive than a few medium-sized Princes or Hare’s Ears. If the highest priority on your fishing vacation is to catch a fish as long as your arm, then bluelining is not for you. You’ll probably need to make plans to join a whole bunch of folks on a famous tailwater to make that dream come true. But if you are willing to trade the chance at that picture fish for a quiet day in beautiful surroundings, with few fellow anglers around, using simple but classic fishing techniques, then start finding and studying maps now and have a adventure this season.